Baseball asks a lot of us. Players, coaches, fans, all of us have different sets of expectations thrust upon us every season. Players have to soldier through a tortuous spate of games and travel days from February into November; coaches have to balance a complete understanding of a team’s tactical strengths and weaknesses while accounting for development and growth; and we, as fans, are asked to keep all of these things in mind as often as we can, at least when we’re not irrationally blowing our top at something stupid that just happened in an inning against the Mets. No player has had more asked of him this season than Scott Kingery. Each member of the team has had their own loads to carry, to be sure, but the weight of expectation has lain heaviest on this rookie. From his meteoric rise through the upper levels of the minor leagues in 2017, to his white-hot Spring Training romp this past March, to the up-to-nine-year contract extension he signed before playing a single Major League game, Kingery seemed positioned to make an instant positive impact. Well, you know what they say about best-laid plans and all that. This season was supposed to be kinder to Kingery. It sure seemed management was convinced he’d do better than .223/.266/.322, even as a rookie, but that hasn’t been the case, and the front office has had to look outside the organization for help as the team’s playoff push progresses into August. 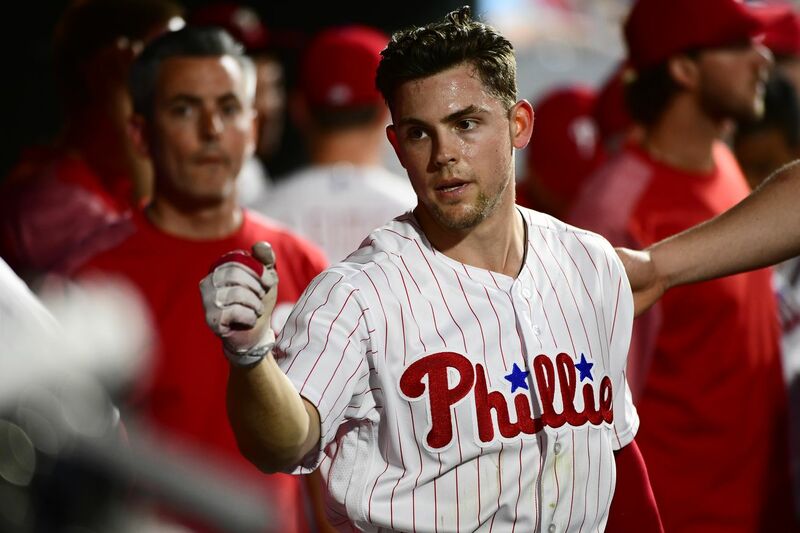 Whether he likes it or not, Kingery is now the Phillies’ poster child for patience, both for how much he’s already been afforded and how much we still have to give him. He’s made it to mid-August despite a prolonged, profound offensive slump that dates back to late April. Part of that was need – once J.P. Crawford and Pedro Florimon were seriously hurt, Kingery became the best option at shortstop simply by default – and part of it was a steady hand from Matt Klentak and company. You could argue that Kingery needs more time at Triple-A anyway, seeing as he only played 63 games there last year, with noticeable dips across his stats as he left hitter-friendly Reading. You could also argue that Kingery’s blazing spring was something of a mirage, bolstered by extra ABs against weaker pitching. Some of that can now be painted as confirmation bias in the wake of this season’s events. Spring performance, as you’ve probably heard once or twice, doesn’t tell a player’s full story either way, but neither does one single season’s worth of plate appearances, especially not those of a rookie. Would it be nice to have every Phillies prospect be the next Ronald Acuna, blitzing through professional baseball to emerge and immediately hold his own at the Major League level at 20 or 21? Hell yeah, it would. But the success of outlier rookies like Acuna can sometimes make us forget how hard it is to be a Major Leaguer, especially in one’s first season. Few of us can ever truly understand how rigorous this job is, and how difficult it is to constantly adjust to a league that’s always adjusting back at you. That’s why it’s so important to remember that the way Kingery has played this season is not necessarily the way he’ll always be. That seems like an easy concept to remember, at least until you watch a player go through as deep a slump as Kingery’s been in for months and feel the frustration mount. It’s not the way you want anyone’s season to go, but if Kingery’s contract (as a base example) proves anything, it’s that the Phillies sure believe there are better things coming. Their patience with Maikel Franco is paying off this year; their patience with Zach Eflin is paying off this year; their patience with Vince Velasquez is paying off this year. The track record of success is getting stronger. Now, not every player is created equal and won’t be afforded the same amount of patience as a rule. But those with talent and implicit potential are going to be given a fair shake at performing for the big club. You can understand what the Yankees and Cubs saw in Aaron Judge and Javier Baez, respectively, as they endured massive struggles as rookies and have since turned into MVP candidates. It’s unlikely Kingery turns into Baez, just as a matter of probability. But the principle of patience the Cubs practiced with Baez is the same one the Phillies are likely to follow, and one we should adopt, as well. Baez struck out in 119 of his first 309 PA as a Major Leaguer. His OPS was .598. Sound a little familiar? Baez showed athleticism and defensive ability, but simply hadn’t put it together at the plate. Now, two full seasons of average-to-above-average play and consistent progression later, Baez has cut his strikeouts and is OPSing over .900 while playing all over the infield for a championship contender. Same goes for Judge, who only even made his debut when he was five days older than Kingery is today. Judge struck out in 42 of his 95 PA, hit .179 and posted a .608 OPS in his first taste of MLB action. You may be aware of how his past season-and-a-half has gone: Rookie of the Year, MVP runner-up, a whole lot of homers, and an ALCS appearance. Baseball is an endurance test, physically and mentally, both for players and fans. There’s a lot to keep in mind at all times, if we’re to avoid being hasty in our judgments and evaluations. To pass this particular test, Kingery must know that this season does not have to foretell his destiny as a Major Leaguer, and for us as fans to understand that the 2018 version of Kingery is but a brick in the foundation of a career house yet to be finished. The same could be said for a number of other Phillies players; from Crawford to Jorge Alfaro to Nick Pivetta to Enyel De Los Santos, we have to be conscious of context, and afford players with potential a legitimate chance to prove themselves. One season, or just a fraction therein, is rarely ever enough. Kingery is not a bust, his contract not a misuse of resources, his potential to be an impact player in this league not invalidated simply as a result of a season of struggle. This is a hurdle to overcome on the path to being a better baseball player, and we as fans owe him – and others going through similar struggles early on in their careers – more time and patience to let a clearer picture develop.